Every Halloween night, young Linus van Pelt, of the Peanuts gang, waits patiently in a pumpkin patch in hopes of catching a glimpse of the Great Pumpkin. Firmly believing the great orange one appears in a sincere patch, he carefully chooses the place where he will wait. Charlie Brown once told Linus that the Great Pumpkin appeared in a garden some where in New Jersey. This only served to keep poor Linus ever faithful in waiting for the almighty vegetable. Poor child, his quest keeps him from enjoying a sugar high, spooky funhouses, and dressing up in costumes. As far as we know, he will continue to wait in the dark; holding his little flashlight ready, hoping to shine the little spot of light on an enormous one should it appear this Halloween night. Linus is right about the Great Pumpkin, but he picks the wrong garden to find him in. Every year, people grow gigantic pumpkins for fun, or to enter their oversized fruit in local fairs, in hopes theirs is the prize winner. In 2006 a new world record was set, the prize one cultivated and nurtured by Ron Wallace of Green, Rhode Island, which weighed in at 1,502 pounds! With a few seed packets and space in a garden, Linus could grow his own sincere pumpkin patch. Add water and fertilizer, and a garden of pumpkins is born. I believe a sincere patch to attract the Great One would have all kinds of pumpkins growing in it. In the sincere patch, the first pumpkin to grow should be the jack-o-lantern type. What's Halloween without a good carving pumpkin? The name says it all. Bigger than Howden it stands strong after carving, with short, thick, strong handles. This Howden hybrid weighs in over 30 pounds, a good percentage weighing 40 or more pounds. This is a Howden-size hybrid with a rounder shape. The vine yields one to two fruits, weighing about 20 pounds or larger, with short, thick handles. Another jack-o-lantern with great handles is named after its New Hampshire breeder, Tom Fox. Twelve to 20 pounds, well-ribbed, deep orange pumpkins with thick, strong handles, the yield is three to four fruits per vine. These are adorable, white, miniature pumpkins that are also edible. 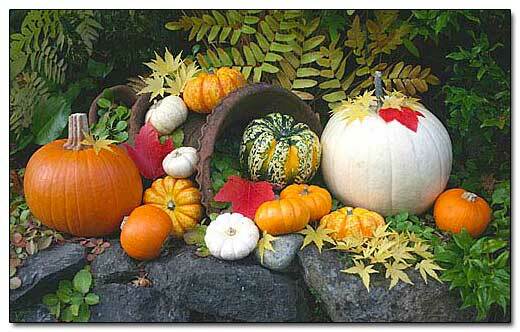 For decorating purposes, harvest them while they are still white, before they mature. When ripe, the pumpkins turn a pale yellow. A special pumpkin that is really a squash, Carnival is dashing with splashes of several shades of green, cream, orange and yellow. Although it isn't as sweet as 'Sweet Dumpling', it's a feast for the eyes. Semi-bush plants are perfect for gardens with limited space. Fairy tales really do come true, especially in this lobed, culinary and decorative pumpkin. Similar to the heirloom squash, Cinderella pumpkin®Rouge vif D'Etampes®Fairytale's small stature and rich mahogany brown color with deep orange flesh makes it a favorite pumpkin for many. The 6 pound, cream skin, and round shape of ghost is good for painting, carving or baking the flesh in a pumpkin pie. A meal in itself, Hooligan is a small, three-inch diameter by two-inch tall, bright pumpkin that can be baked, stuffed or microwaved. Not only is it highly decorative with its variegated skin, it stores well if kept at 50° F (10°C) through winter. Add a large, 10 to 12 pound, ghostly pumpkin, with white skin and strong handles, to your fall decorations . Lightly ribbed, roundly shaped, with white skin and thick, golden flesh, this pumpkin makes a great choice for creative and unusual pumpkin art. Each vine yields 4-6 white pumpkins. For the best white color, harvest before pumpkins are mature. This is a bumpy new cultivar with a blue-green slate tone and blistery flesh that is the envy of the ghoul and monster neighborhood. Weighing in between 6 and 12 pounds, this squash is also a great culinary choice. You can have your decoration and eat it too. The vine yields two fruits per plant. This 6 to 10 pound fruit has a beautiful drum shape. With long storage life, the highly decorative, ribbed fruit has slate-gray skin, with sweet, orange flesh. The vine yields two fruits per plant. The 20 pound squash has orange and cream-colored variegated skin, with the red veins darkening the longer it is stored, giving it a bloodshot eye appearance. Powdery mildew tolerant, use this one for decorating, carving or pumpkin pies. This is a small jack-o-lantern style pumpkin. Baby Bear weighs in at 1½ pounds. Its fine grain flesh is a perfect choice for pies, and hull-less seeds are great for roasting for nutritious snacks. The pumpkin will store well for three to four months after harvest. This is a choice quality pumpkin for baking pies because of its dry, sweet flesh. With bright, deep orange skin and a thick, tan handle, this attractive small pie pumpkin has an average weight of 4 pounds. Baby Pam yields four to five fruits per vine. Ready to harvest in 85 days, the semi-bush skin and lopsided look add loads of charm to autumn decorations. The vines are powdery mildew tolerant and produce many novel 1 pound deep gold pumpkins that are good eating. The golden fruits have long dark handles. D. Brent Loy of the University of New Hampshire bred this uniform round fruit with a bright orange, non-ribbed skin. A favorite pumpkin for painting, the plant is more bush then vine, producing 6 to 9 pound fruits with long, sturdy handles. 'Orange Smoothie' is a 2002 All-America Selections winner and yields three to four fruits per plant. A favorite pumpkin for children, its wee size of 3-4 inches is also great for decorations and eating. Each vine will yield 12 tiny pumpkins that are good keepers. About the size of a baseball and almost as round, the tiny pumpkin grows on a semi-bush and yields about eight pumpkins per plant. 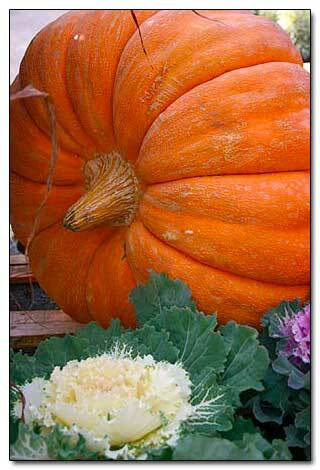 Commonly called the Cinderella pumpkin, its orange-red skin, deep lobes and low profile makes it one of my favorites. I always plant this old French heirloom in my pumpkin patch. Average weight per pumpkin is 15 pounds and yield is two pumpkins per plant. Fairy Tale®Shaped like a cheese wheel, with thick, delicious flesh. Sugar Pie®Classic pie pumpkin, with sweet flesh, around 8 pounds. Linus can grow his own gigantic pumpkins to amaze and delight his skeptical friends. Top image photographed at Valley Nursery in Poulsbo. All the other images were made in the author's garden.